Daphne, AL. (April 2, 2019) – Dr. Michael Chamblee, a board certified and fellowship-trained Orthopaedic surgeon with Baldwin Bone & Joint, was recently recognized with a Patients’ Choice Award for 2018 from Vitals, an online database of medical professionals owned by WebMD that ranks physicians based on patient experience and feedback. Dr. Chamblee, an Orthopaedic surgery specialist, has over 13 years of diverse experience, specializing in anterior hip replacement. A Patients’ Choice recognition reflects the difference a physician has made in the lives of his or her patients. It is bestowed on physicians who have received near perfect scores, as voted on by patients, according to information provided on the Vitals website. Dr. Chamblee also received this award in 2017. In 2018, more than 280 million people used Vitals to search for healthcare options based on specialty, doctor and/or condition. One of the largest digital health properties in the U.S., Vitals Consumer Services Division is comprised of Vitals.com and UCompareHealthCare.com. In August 2018, both online platforms became subsidiaries of WebMD. Since 1989, Baldwin Bone & Joint has provided expert orthopaedic care to patients of all ages, with all conditions. As fellowship-trained orthopaedic surgeons and experienced clinicians, they are recognized leaders in the field of orthopaedics, providing the most current treatment available. Office locations include Daphne, Bay Minette and Orange Beach. Specialized clinics available are The Spine Institute at Baldwin Bone & Joint, The Center for Sports Medicine, and The Shoulder Center at Baldwin Bone & Joint. For more information, visit https://baldwinboneandjoint.com or call 251.625.2663. Daphne, AL (February 27, 2019) — Dr. Paul B. Canale, a board certified and fellowship-trained orthopaedic surgeon at The Spine Institute at Baldwin Bone & Joint, was recently recognized with two awards, in part for the difference he makes in the lives of his patients. Daphne, AL (January 25, 2019) – Daphne-based Baldwin Bone & Joint is pleased to announce the recent expansion of hospital coverage to include South Baldwin Regional Medical Center (SBRMC) located in Foley, AL. The SBRMC hospital board recently formalized medical staff privileges for Drs. John Todd, Drew Corbett, Matthew Goldman and Michael Chamblee, board-certified, fellowship-trained orthopaedic surgeons with Baldwin Bone & Joint. Additionally, Baldwin Bone & Joint physicians serve on medical staff with Infirmary Health (Thomas Hospital and Thomas Medical Center, Baldwin County) and Providence Hospital in Mobile, AL. “We are delighted to expand our services in Baldwin County and look forward to this new relationship in South Baldwin County. We continually strive to ensure a positive experience for each patient and their family members with convenience as an added value,” says Greg Shoemaker, Practice Administrator. Daphne, AL (January 23, 2019) – The Spine Institute at Baldwin Bone & Joint recently expanded to include Dr. Charles Gordon Jr., the only fellowship-trained neck and spine surgeon on the Alabama and Mississippi Gulf Coast who performs minimally invasive neck and spine surgeries in Mobile and Baldwin County. 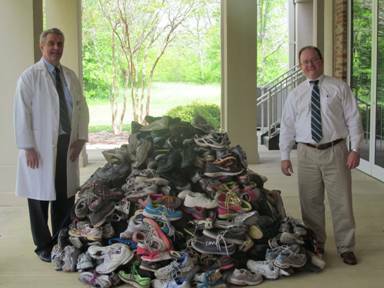 Specialized clinics available are The Spine Institute at Baldwin Bone & Joint, The Center for Sports Medicine, and The Shoulder Center at Baldwin ..
Gently used athletic shoe donations will be accepted through March 23. For more information and drop-off locations visit baldwinboneandjoint.com. Gently used athletic shoe donations will accepted through March 23. For more information and drop-off locations visit baldwinboneandjoint.com. The 16th annual Many More Miles campaign is currently in process. Local runners … Baldwin Bone & Joint is again hosting this community project. 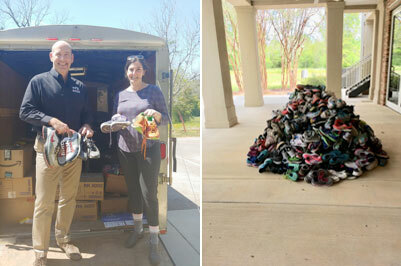 Daphne, AL (December 11, 2018) – Local runners and exercise enthusiasts may have put a lot of miles on old running shoes, but when they are donated to the “Many More Miles” campaign, those shoes will come to life again as they land on the feet of someone who really needs them. For the 16th consecutive year, Baldwin Bone & Joint, P.C. will once again host this important community project, partnering with the Port City Pacers, Dr. Glenn Glass, The University of South Alabama Student Recreation Center, and local schools to collect shoes for the homeless outreach programs of Wings of Life and for, the first year, Family Promise of Baldwin County. Zachary Lovato, DO, joined El Paso (Texas) Specialty Hospital. 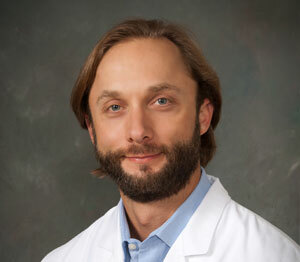 Charles Gordon Jr., MD, joined Baldwin Bone & Joint in Daphne, Ala. More articles on …. Charles Gordon Jr., MD, joined the team of orthopaedic specialists at Baldwin Bone & Joint in Daphne, Ala.
Dr. Gordon recently completed a spine surgery fellowship with the University of Maryland’s R. Adams Cowley Shock Trauma Center in Baltimore. Dr. Gordon is trained in minimally invasive and robotic spine surgery techniques. After earning his medical degree from the University of Arkansas for Medical Sciences in Little Rock, Dr. Gordon completed an internship in general surgery at Vanderbilt University in Nashville and residency in orthopaedic surgery from State University of New York at Buffalo.